A county by county guide of splash-down river, tidal roads and low water crossings throughout the UK. Please take particular care when crossing all fords and floodwater (some tips and advice are available here). 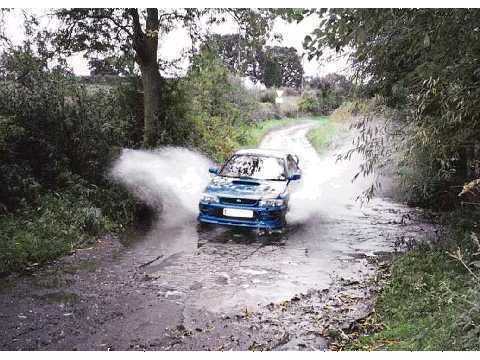 wetroads is simply a record of Welsh, Irish, Scottish and English fords at the turn of the millenium and the inclusion of a ford in this guide does not guarantee that the ford is a public right of way or is safe to cross. If you enjoy taking part in adventurous driving activities like driving off-road, or racing, it's very important you make sure you are covered by your car insurance policy - you may be required to purchase additional cover for more extreme activities. Likewise, when travelling around Europe, an EHIC card is essential for your journey. Finally, read our guidelines for crossing fords and make sure your vehicle is well maintained. A massive 2214 fords now identified and online including 2144 full listings with images, plus an extra 49 fords overseas! Compiled by Prof. Lee Chapman. Please email to be put on the distribution list for future updates. High Glenadale in Argyll & Bute, Bagnor in Berkshire, Cowlands Tidal Road, Crift, Lezant and Wortha in Cornwall, Beckfoot Farm, Cumwhitton, Greensburn, Ireby and Scout Green in Cumbria, Blackbrook in Derbyshire, Baileys Ford, Budleigh Salterton, Cocktree Throat, Combe Raleigh, Cotleigh, Coxmoor Ford, Farringdon, Farway, Fishleigh Barton, Henrys Ford, Hilltown, Kentisbeare, Little Kidland, Lower Tidderson, Lower Tidderson, Meshaw, Otterfalls, Rackenford, Rockbeare, Romansleigh, Slade, St Thomas, Star Barton Farm, Taw Marsh, West Cross Side, Weston, Whitford, Wiggaton and Winneford in Devon, Bishops Caundle, Bloxworth, Fifehead St Quintin, Holt Heath, Kingston Russell, Loscombe, Puncknowle, Spetisbury, Uploders, White Lackington, Withyhook and Woolcombe in Dorset, Coggeshall, Cressing and Stisted in Essex, Laverton in Gloucestershire, Delph and Lees in Greater Manchester, Crampmoor and Plaitford in Hampshire, Lucton, Merryhurst Green, Monkland and Upper Hergest in Herefordshire, Garrogie Lodge in Highlands & Islands, Bay Horse, Cantsfield and Tarnbrook in Lancashire, Bewerley Moor, Blow Gill, Boltby, Boltby, Burton Leonard, Capelshaw Beck, Cowhouse Bank, Dalton, Dalton-on-Tees, Ellerbeck, Fall Rigg, Farwath, Feizor, Firby, Foxton, Gordale Scar, Hanging Bottom, Hartforth Hall, Hazlewood Moor, Hog Gill, Kirby Sigston, Lady Anns Way, Litton, Low Muffles, Malham, Markington, Melsonby, Hartoft, Nappa Mill, Osseker Crook Wath, Ravensthorpe Mill, Red Way, Rosedale, Storthwaite Hall, Swinelair Farm, Thornton Rust, Thornton-le-Dale, Westerdale, Westerdale and Wilsill in North Yorkshire, Batailshiel Haugh, Cockshot, College Valley, Greenless, Kidlandlee, Linhope, Mitford and Wooler Common in Northumberland, Burnhead, Duncanhaugh, Halterburn and Mowhaugh in Scottish Borders, Lower Darnford, Middlehope and Worthen in Shropshire, Babcary, Baggridge, Dowlish Wake, Englishcombe, Faulkland, Hewish, Lower Vexford, Stoney Stratton, Sutton Montis and Tarr Steps in Somerset, Gorstead Mill in Staffordshire, Woodgate Valley in West Midlands, Coombe Bissett in Wiltshire. Drive safely! For information on maintenance and what to do in a breakdown, see our guide here. A wide range of spares and parts to help in your fording adventures are available from autopartspro.co.uk.